What did I do on the hottest day of September? Make jam of course! Ok so that was not the best idea ever but sometimes ya just got to get that jam made. I made a point to pick up the fruit at the Farmers Market last weekend with the purpose of making jam this week. By the time Wednesday rolled around I knew I really needed to get the jam started. I am so very proud of myself for getting the fruit all prepared over the weekend. See the thing is that peeling several pounds of peaches is not quite the best thing to do last minute. I have learned that by cutting my fruit the day or two before really helps me make a marathon day of jam making less overwhelming. This may be the way I make jam from this point on. It was so easy to grab a sack of fruit ready to go from the fridge to be dumped into my jam pot. I loved the ease of the day's process with only setup being the big task. All I needed to do was make sure the jars and lids were clean and sterile, wait for the canner pot to come to a boil, and set up the counter for jar filling. I didn't make too much jam last year. I kept it simple. 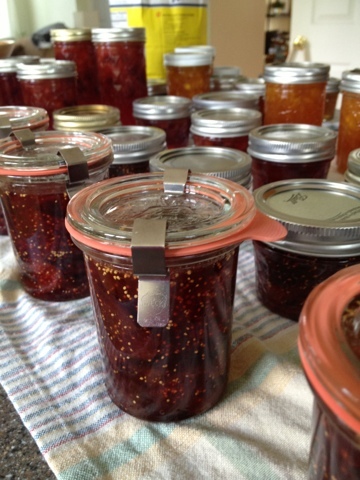 I was tremendously busy last summer which left me with less time to devote to putting up jam. That's why this year I was determined to get a good variety made. I began with Leah's favorite jam. Last time I made the Plumeach jam was three years ago just mere days before I went into labor with Adelynn. There I was earlier today in my kitchen laughing to myself about how I was pregnant the last time this jam was made. No, I did not go into labor this time. I still have 4 months to go yet but I figured it has to be tradition to make this jam while pregnant. Just like last time the Plumeach jam turned out to be a beautiful jewel purple color. It's certainly one of my favorite looking jams. After sampling some I was reminded about how much we loved it. Oh so good. Just like summer in a jar good. With one batch complete it was time to start another. Eager to try a new jam flavor I set to work on making fig jam. A friend of mine made some and gave me a jar as a gift. It was so good that I admit to NOT sharing that jam with anyone in this house. That's why when I saw a farmer at the market had a bumper crop of figs I bought them. I would have bought every last one of his figs if I didn't run out of money. I think this jam will become a favorite. Leah was hooked on eating the fresh fruit so I think she may want to hide a jar just for herself too. Most of the recipes wanted the jam to cook down and gel on its own. I considered that for like 1 minute. Then I realized that I was not going to stand in my kitchen for an hour letting the figs simmer down to a sticky jam. These days standing for long periods of time is not my idea of comfortable. To speed up the process I opted to add a packet of liquid pectin to my figs. Typically when I use the liquid pectin my jams do not gel as well as they do with the powder form. I took that knowledge and decided that perhaps all I needed was just a little help getting the fig mixture to gel. I think based on the result of my cooled spoon my deduction was spot on. The liquid pectin did the trick and saved me from standing around a pot stirring jam for an hour. The last fruit to be turned into jam were the peaches. Usually the first jam I make this time it came in last. As I began I kept thinking "oh just the peach jam again" the 'ol standby. Tried and true peach jam. After making it for 4 years straight it seems so boring. Dutifully I stood over that pot stirring the golden fruit with massive amounts of sugar until it turned a deeper golden color. After filling the jars, closing them up, and putting them in the canner I turned to the clean up. There was a spoon sitting there in the pot. I thought to myself 'If I think this jam is so boring then why do I make it every year?' with that thought in my head I took a taste of the jam on that spoon. That's when I realized why I keep making peach jam. It. Is. So. Good. Peach is my favorite flavor. More so than most. I didn't remember that minutes before. One taste brought back so many summers. Summers as a little girl where I would sneak over the fence to the farmer's orchard and hide under his peach trees giddily eating peaches until my stomach was painfully full. Summers taking my girls peach picking for the first time. Summers of peach trifle. Oh summer. Peach is the fruit of summer. It just gives me the joy of so many summers past that this jam is one I rely on in the dark days of winter. By the late afternoon I was done. About ready to clean up everything and put away my jars when that bottle of Malbec caught my eye. Keith opened it up Saturday night to go along with our supper. He drank a glass and since then the bottle has been hiding on the counter. I'm sure he intends to drink the rest of it but I know that he's not the wine drinker I am. That bottle could last him a whole month and by then it will be lousy. I know I can't use it all for cooking. There's certainly no room in the fridge for it either. The only way I could think of to put it to good use was turning it into jelly. Wine jelly. Never have I made jelly. Never have I made a wine jelly. Nevertheless I jumped right in. The bottle of wine was emptied into a small stock pot. I let it simmer until it was half its volume. I added some lemon juice and another packet of liquid pectin. I let the mixture simmer a few minutes more before adding 4 cups of sugar. I let the jelly cook until it thickened some more. Once it began to gel it was time to fill the jars. Wine jelly does not make a big batch. It's a great gift size jelly. Many people serve wine jelly with cheese and crackers. To me it tasted like an amazing grape jelly. Perhaps it will be a great jelly to use for grown-up peanut butter and jelly sandwiches. Three jams and one jelly. That is a productive day. While I always think there are more jams to make I think after today we're set with jam for the year. Many of these delights will find new homes this Christmas. Which reminds me that next week I will need to label the jars with names of who gets what jam. I may even pack up some boxes to have ready for the post. It's all just in case. Just in case this baby #4 decides to come early. Or just in case I need to keep myself from eating ALL that yummy jam. Boxing them up sounds like a great idea to keep my jam cravings from getting out of hand.